Delmarva Board Sport Adventures is one of the best paddleboarding and windsurfing adventure companies in Delaware. Popular and highly rated for their stand-up paddling experience, they are ranked #1 in their field and possess all the relevant certifications, allowing you to enjoy your water adventure with complete peace of mind. Unfortunately, due to insurance regulations, non-swimmers are unable to hire watersports equipment at Delmarva. · Rental – Delmarva offerspaddleboards, kayaks, and windsurfing boards to rent from time periods as short as 1 or 2 hours to up to as long as a week. · Guided Excursions – Beginners and families can opt for guided excursions that begin with a lesson. Participants must have good balance and possess swimming experience. · Recommendations – For experienced boarders, the company makes recommendations regarding safe locations for paddleboarding. · Weather Monitoring –Delmarva keeps a close watch on the weather forecast to check whether the weather will come in the way of a scheduled paddleboarding adventure. · Activity Rescheduling – Any trip that cannot take place due to weather conditions is rescheduled. · Safety Accessories – The company provides a few essential items that you might have forgotten to pack. Other items, such as a dry pack for cellphones, a safety strap for sunglasses, and sunscreen, can be added on when you make your reservation. · Rescue Service – Delmarva offers rescue services for customers for a $50 fee. · Delivery Service – Paddleboards and kayaks can bedelivered to locations in Sussex County in Southern Delaware for a $25 charge. Some of the company’s main rental and guided tour centers are at the Bay Resort Motel, the Broadkill River in Milton, and Broad Creek Laurel. · Tax-free Sales – The Delmarva showroom in Rehoboth Beach sells tax-free paddleboards that customers can try out before choosing to invest in their own equipment. · Paddleboard rentals start from $25 for an hour to $185 for a week. · A self-serve single kayak costs $20 per hour and $175 for a week, while the tandem self-serve kayak costs $25 for an hour and $195 for a week. 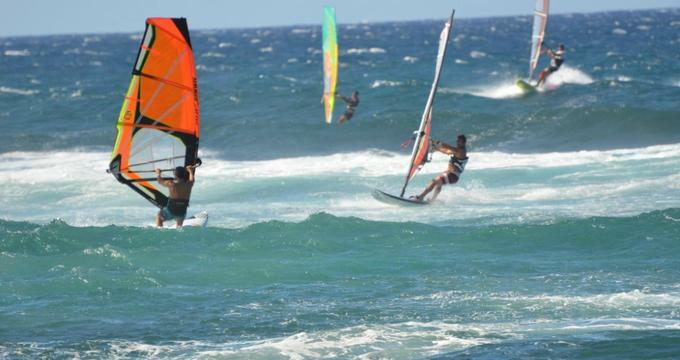 · Windsurfrentals – A trainer rig with professional lessons costs $150 for 2 hours or $275 for 4 hours. Just the trainer rig without the lessons starts at $75 for 4 hours and continues until $325 for one week. Damage charges are applicable if the equipment is punctured or damaged and lost or broken paddles are also charged to the customer. Delmarva accepts online bookings and phone reservations; a credit card is required.